I wasn’t super excited about trying this wine. It comes in a decidedly dull bottle. The label looks like it was someone trying real hard to make fancy-schmancy looking wedding invitations in Microsoft Publisher having read the business card design advice in American Psycho and discovered a font that made them feel special on a tighter budget. That shouldn’t really put me off, but it did, so there. 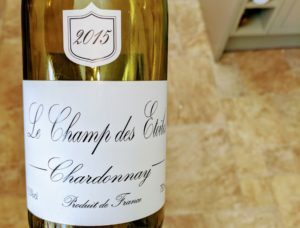 This Le Champ des Etoiles Chardonnay ’15 from Laithwaites is a Chardonnay from Languedoc way in the south of France that’s made in the style of a Burgundy from much further north. That’s not an easy trick to pull off but there’s a huge price differential between the two so if you can make an even half way credible attempt at it it’s worthwhile. The taste of peaches carried through with tangy citrus, the cherry blossom disappeared, but the yeasty lees flavour just about hung in there which gave it a bit more heft than I’d expected. There was no real hint of oak, but as it was aged in old oak casks, I didn’t expect much. It had a medium body, the yeasty flavour boosting it up along with the 13% alcohol. No-one is going to mistake this for a Burgundy, unless they are an American who grew up in a world where all Chardonnays from anywhere were called “White Burgundy” and often came in wonderful three bottle flaggons (it turns out “Carlo Rossi” still sells them. I’ll have to try some on my next visit). That said, if you accept that it’s a well priced French Chardonnay with a bit of character, then it’s a sensible buy. Serve it quite cold, it does need some chill to take the edge of the hint of sugar. Can i try it over there.